I was given my first shot at directing by Joe Pearson, a fellow ex-D.I.C.ster I had worked with on “The Littles”, and “Spiral Zone”. He was best friends and writing partners with Kevin Altieri, and was one of my best friends as well. He was the first person I’d come out to in animation. 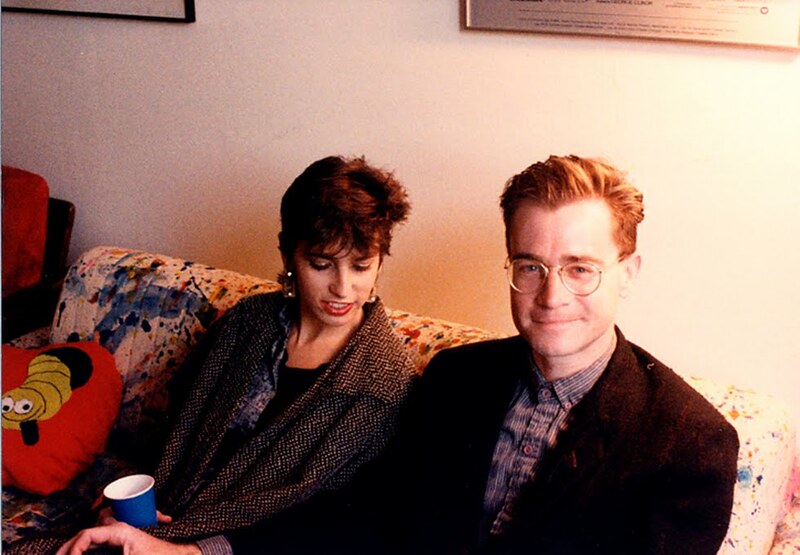 He and his fiancée , Lisa, had attended my commitment ceremony to John; John and I had gone to his wedding. 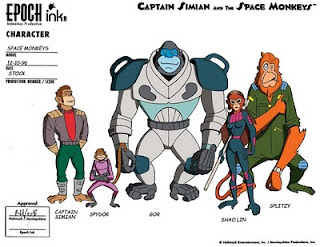 Joe had started his animation studio, Epoch Ink, to produce 26 half hours of “Captain Simian and the Space Monkeys”. He hired Dave Schwartz, a fellow D.I.C. and Disney alumni, and I to co-direct alternating episodes. Directing was another trial-by-fire, sink-or-swim experience. I felt I was on the verge of screwing up at all times, in ways that I wouldn’t even know about for months. I developed irritable bowel syndrome and low back pain. Yet I wouldn’t have traded it. I was working with a community of friends, almost a family. The atmosphere was relaxed, convivial. We had a ping-pong table in the back room; I played my guitar and sang during lunch. 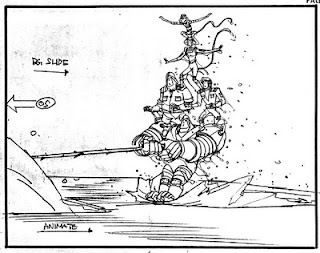 Joe offered the studio’s services to Kevin, helping out on pre-production of the “Gen 13” feature, and co-producing, along with Kevin and Todd McFarlane, an animated music video for Pearl Jam. I had a ring-side seat for all of this, as well as being the only artist besides Kevin who boarded on “Gen 13”. 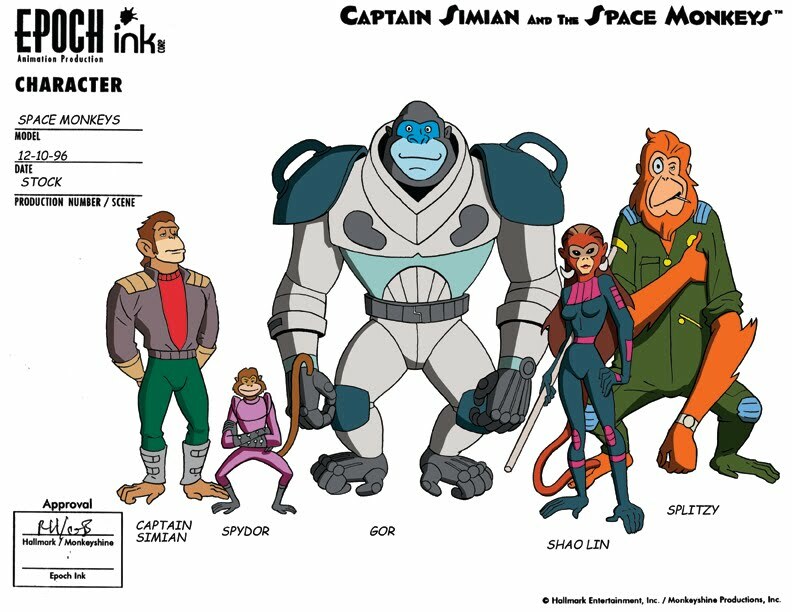 Note: The model sheet line-up displayed here is part of my pass at doing the character designs for "Space Monkeys". Joe and the other producer/creators, Gordon Bressack, Rob Hudnut, and Gary Hartle, paid me and a number of other animation artists to work up model sheet treatments of the main characters. 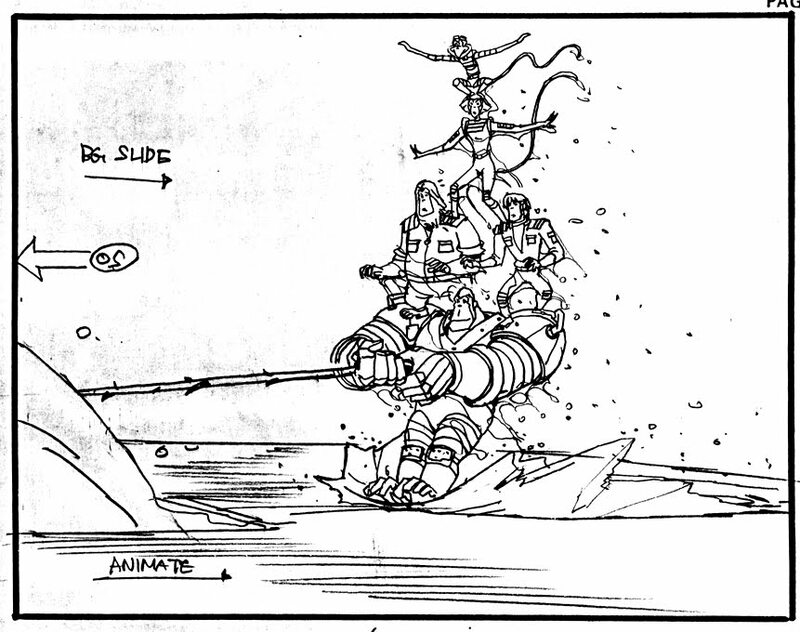 Joe and co ended up settling on Brad Coombs, a Canadian artist who had worked primarily for Nelvana, making him the primary stylist for the series. 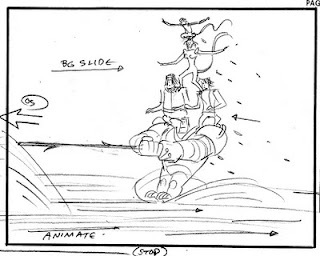 Note 2: The 2 storyboard panels shown here are from the Space Monkeys Episode entitled "Surf Monkeys Must Die". 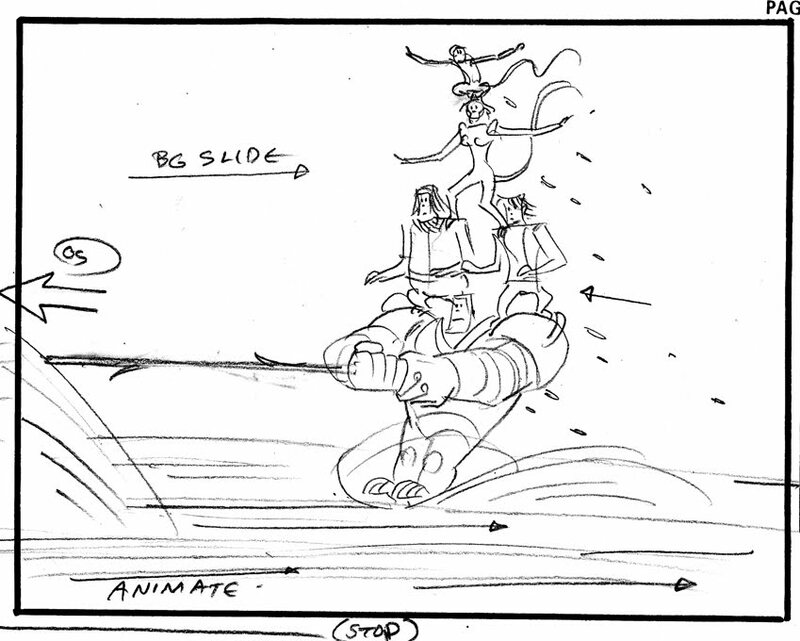 I storyboarded a quarter of that episode in tight rough form. 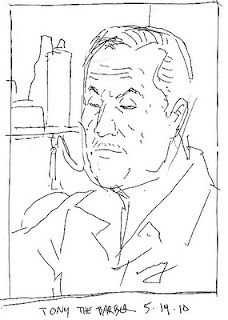 These roughs were cleaned by Young Yune, an excellent board artist and designer in his own right; we called him "the Korean Otomo" (referring to Katsuhiro Otomo, creator of "Akira"). It was a joy to have him clean my stuff. Sorry about my long absence from blogging. I've been super busy for the past 3 months. I finished up on "Neighbors From Hell", while free-lancing on "GI Joe" and "The Avengers". As I was finishing up the "Avengers" storyboard, I received the galley to my upcoming DC/Vertigo graphic novel, "Fogtown" from the new editor, Will Dennis. With his indulgent permission, I completely re-did the display lettering and sound effects, taking about 3 days solid. Now that's all behind me. The only deadline I currently have is my upcoming show of the original artwork to "Fogtown" at Flazh! Alley Studios in San Pedro California, July 25 through September 4. Basically, I have to frame 40 pieces of artwork, a massive undertaking. Yeow. Anyway, I got my hair cut yesterday at Tony's Barber Shop. I've been getting trimmed there an a pretty much monthly basis for the last 20 years. 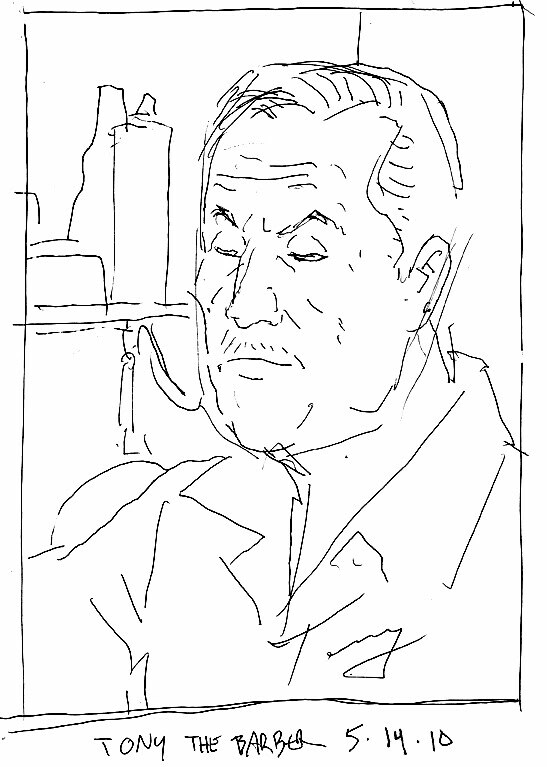 I finally got around to doing a sketch of Tony as part of my on-going project to do a drawing of everyone I know. His name is Tony Cornejo; the shop is located at 2552 Glendale Blvd, Los Angeles (Silverlake) 90039. (323) 663-9589. Open 8:30 am - 7:00 pm , Sundays, 3:30 am, 4:00 pm.